Spacious chalet in a large exotic garden in Étang-Salé. Beach 12 min - chalet " manguier "
Property 8: Spacious chalet in a large exotic garden in Étang-Salé. 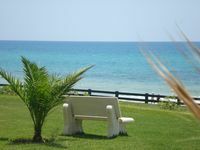 Beach 12 min - chalet " manguier "
Property 12: Beautiful spacious Apartment with stunning sea views and centrally located. Property 22: A bungalow right on the water, with one of the world’s most beautiful views. Property 49: Panoramic sea views. Beach 100m. Spectacular! Property 50: Private Peaceful Villa with Private Pool. €70/night one couple, €20/extra guest. This place was amazing! Three bedrooms, each with its own bathroom and storage closets. The kitchen facilities are totally adequate. This place truly reflects the loveliness of Moroccan culture. The roof patio was my favorite place in Marrakech! The caretaker was helpful, kind and honest. 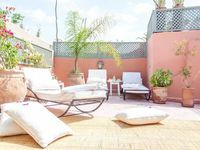 I recommend this riad completely.